Super excited for this series. I hope you’re going to do Holochain, IPFS, Secure Scuttlebutt, and DAT! Problem is that dWeb most likely will fast become illegal, pushed by big corporations. The world is run by small people with big wallets. And a movement of good-doing devs will not have a chance against fat wallets. My prediction is that it will start with propaganda. Headlines that say “Is dWeb here to stay? No says experts” and “Dweb is riddled with security issues”. Making potentional users unsure. And if that will not kill it they will start the “Making this sh*t illegal” campaign. Probably taking all p2p traffic with it. Because Control = Money + Power. Sorry, you said no assumptions but this is just my prophetical prediction. The big companies would also introduce illegal content deliberately, as they do with torrent. It is with a heavy heart that I agree with Linus. It wish it were not so. Wow! Super nice! IPFS All the way! Distributed networks are the next step in our bumpy evolution towards true intellectual freedom, and perhaps physical freedom as well as any good definition of freedom has to include financial freedom or the opportunity to attain it. You are fighting some basic human instincts. Humans cleave to hierarchy tenaciously as a means to prevent others (or groups of others) from cutting in line. People are content to keep their place in line as long as they believe their turn will come. Creating distributed networks as the single way to disseminate information will only happen once we assuage their fears of someone taking their piece of pie. I hate the philosophic/metaphoric tone of my post; but the topic is so huge I don’t know how else to convey the info without going on at length. Distributed networking is not simply a technical challenge, it is a social/cultural/political one as well. I am truly happy Mozilla supports this kind of a future. HTTP implies a client and a server, just change the protocol to something that is fully p2p. Looking forward to new blog posts! Played around with some dApps on the EOS Blockchain. It is such an interesting concept to play around with, sadly I don’t see mainstream adoption happening anytime soon. It would be nice to also have this as a portable protocol agnostic library with a known interface like sockets, or that overrides the existing syscalls like good ol’ tsocks. That way, virtually any program will support it natively. Looking forward to this series! With the evolution and adoption of cross-cloud containerization and a serverless mindset, truly distributed systems are ripe for implementation. Please cover Maidsafe too. They are building a very cool technology. I hope this means IPFS. I would immediately switch to Firefox if it would have support for IPFS. It would be good if you can cover all of these: ZeroNet, IPFS, DAT/Beaker Browser, Blockstack, Maidsafe, and FreeNet. Great initiative! Please cover Holochain and IPFS. I’m not too worried about the inevitable political and mass-adoption hurdles. A large minority adopting the “radical” dweb will still be quite large nowadays. We don’t need to convince everyone. While the corruptos might be able to slow us down initially, they can’t stop us if we keep at it. – distributed: a decentralized system using a P2P network of clients, each of which also acts as a server (eg SSB, BitTorrent [if you don’t count trackers] BitCoin and other crypto-token systems, Twister, BitMessage). 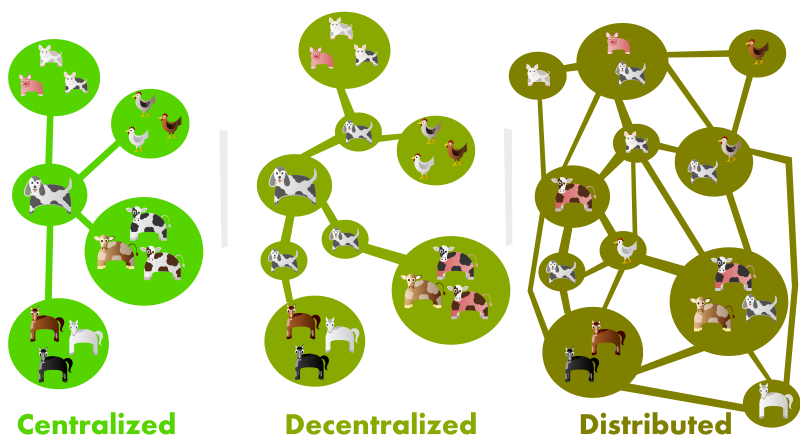 Before anyone points me at the classic graph, the one that uses “decentralized” where I propose using “federated”, I’m aware. But that graph is not gospel, it’s someone’s proposed definitions, just like these ones are. The word “decentralized” was being used in political discourse long before that graph, and before the internet, particularly (but not exclusively) by anarchist writers. The definition they used is closer to the one I propose, and many people seem to find arguments that “distributed” is *not* “decentralized” counter-intuitive.